In the summer, our yards are abuzz with insects belonging to the order Hymenoptera: bees, wasps, ants, and sawflies (also called wood wasps). The third largest order of insects, scientists believe that hymenopterans evolved from sawfly-like insects that first appeared more than 200 million years ago during the Triassic Period. Hymenoptera (hi-men-OP-terr-uh) is from the Greek humen for membrane and pteron for wing, which describes two of the common features of these insects. Bees pollinate our plants and produce honey for backyard beekeepers. Wasps pollinate, as well as prey on numerous pest insects. Ants clean up organic debris, turn our soil and feed on pests, such as slugs, aphids, and spider mites. The tunneling habit of ants is said to aerate the soil as much as earthworms do. On a broader scale, bees contribute billions of dollars annually to the U.S. Gross Domestic Product through crop pollination and production of honey and beeswax. Parasitic wasps are valuable to farmers, many of whom buy them from commercial insectaries for biological pest control. And, the insects themselves are an essential food source for other animals. The number of Hymenoptera species in the world varies, depending on the source. According to BugGuide.net, a community of professional and amateur entomologists, there are more than 153,000 species. The Smithsonian Institution and the Encyclopedia Britannica estimate about 115,000. Other sources range as low as 100,000. Most sources agree, however, that 17,000 to 18,000 species are inhabitants of the U.S.
Two pairs of membranous (thin, often see-through) wings, although some species have wings only during mating flights (for example, ants) or lack wings altogether. Wings have minimal veining, and the forewings are larger than the hindwings. The forewings and hindwings lock together with tiny hooks. In smaller species, this can give the impression of being just a single pair. Compound eyes, usually large. A few ant and wasp species are blind. Chewing mouthparts, although some have a modified lower lip that forms a tongue. Females usually have an ovipositor (egg-laying organ) that’s modified to either saw, pierce or sting. Life cycle: complete metamorphosis, which is a progression from an egg to a larva and then to a pupa from which they emerge as an adult. Hymenopterans range in size from tiny, so-called “fairyflies,” about 0.008 of an inch long (0.21 mm) to the 1.8-inch (45 mm) Asian Giant Hornet, Vespa mandarinia. Hymenoptera is split into two suborders: Apocrita and Symphyta. Apocrita (uh-PAH-cree-tuh) contains bees, wasps, and ants. This group can be easily identified because they have an abdominal constriction that separates the abdomen from the thorax and looks like a “waist.” Many also have a stinger. Symphyta (sim-FI-tuh), the other suborder, consists of sawflies. Sawflies are related to wasps, but resemble flies because they lack the familiar, thin wasp “waist.” “Saw” comes from the females’ saw-like ovipositor, which they use to slit openings into plants where they lay their eggs. Most hymenopterans are solitary and live alone — mud dauber wasps, potter wasps, and mason bees are some examples. But there are others that are social, meaning they live in colonies — well-known examples are honeybees and bumblebees, as well as yellow jacket and paper wasps. All ants are social. Look closely, and you’ll see there are many kinds of bees in your yard, not just honeybees and bumblebees. 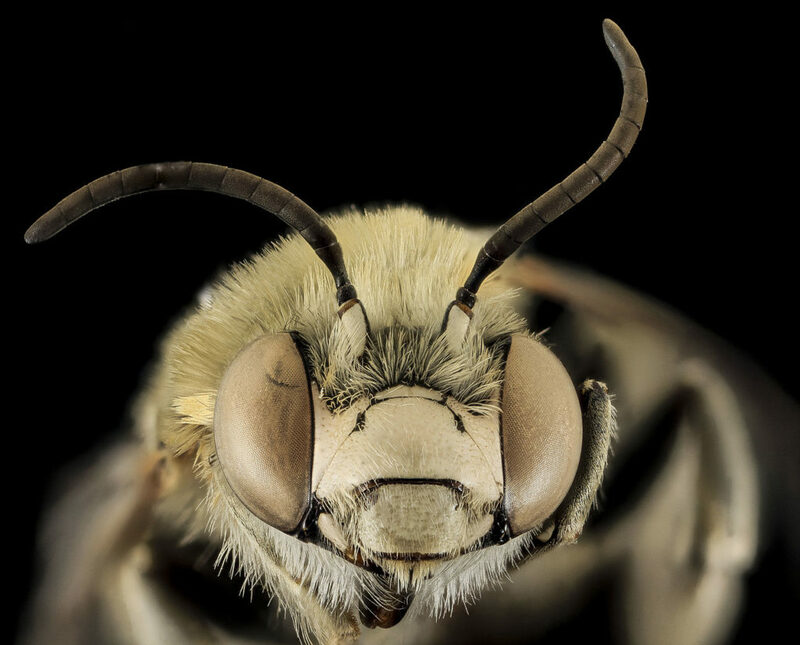 There are also sweat bees, carpenter bees, mason bees and others. All bee species have hair somewhere on their body. Their hair can help you distinguish bees from wasps, which are mostly hairless. The hair is important because it traps pollen as bees move from flower to flower sipping nectar. 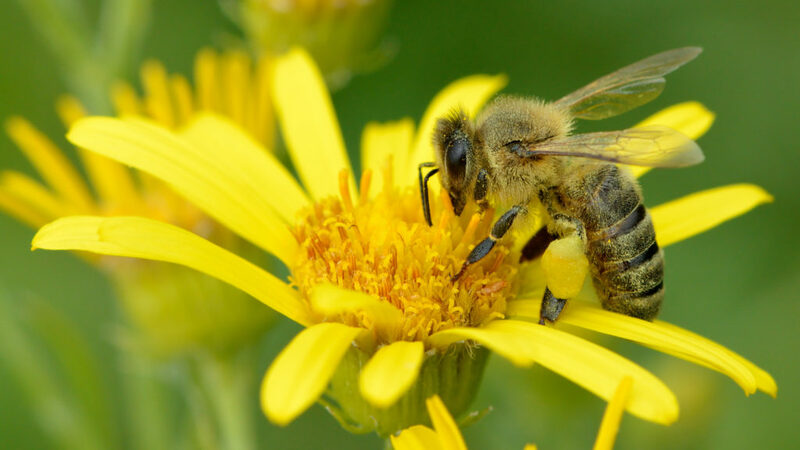 The pollen gets rubbed off and pollinates many flowers as they go. Bees value pollen as food and fly it back to their hives. Beforehand, they moisten and stick it to a flat area on their back legs called a pollen basket. The “basket” doesn’t exist in a way we think of one; it’s a surface surrounded by hairs that help hold the ball of pollen in place. The ball grows larger and larger as they add to it. This Honeybee, Apis mellifera, has pollen clinging to her body. The solid yellow oval on her leg is a packed pollen basket. (Ivar Leidus / Wiki; cc by-sa 4. In the winter, depending on the species, bee queens hibernate alone, and their colonies die off or, like honeybees, entire colonies stay alive in their hives. Those don’t hibernate and may even venture out on warm winter days. All bees (except cuckoo bees) build nests. Nests are located in a variety of places. Some species, such as mason bees, nest in holes. Carpenter bees drill nesting holes in wood. Others, like miner bees, dig holes in the ground. Honeybee hives may be found in trees, tree hollows or even walls and attics. Bumblebees may build their nests in such places as existing, abandoned holes underground, under sheds or loose siding, in woodpiles or in birdhouses. There are 4,000 native bee species in North America. The southwestern U.S. and northern Mexico are home to the largest variety of bees in the world. There are 1,000 to 1,200 species of bees “within a one hundred mile radius of Tucson,” according to the Carol Hayden Bee Research Center in Tucson. Around the world, about 25,000 species have been described so far. Of these, there are seven species and 44 subspecies of honeybees. The smallest bees in the world belong to the genus Perdita. Native to the U.S. and Mexico, there are about 700 species and subspecies of them ranging in size from 0.08 to 0.39 inch (2.0 mm to 10.0 mm). Wallace’s Giant Bee, Megachile pluto, an Indonesian species, is considered to be the largest bee species in the world. The female has a body length up to 1.5 inches (38 mm) and a wingspan of 2.5 inches (63.5 mm). In the U.S., the smallest bee is Perdita minima, the size of a gnat. The largest bees are carpenter bees which measure from 0.75 to 1.0 inch (1.9 to 2.54 cm) in length. 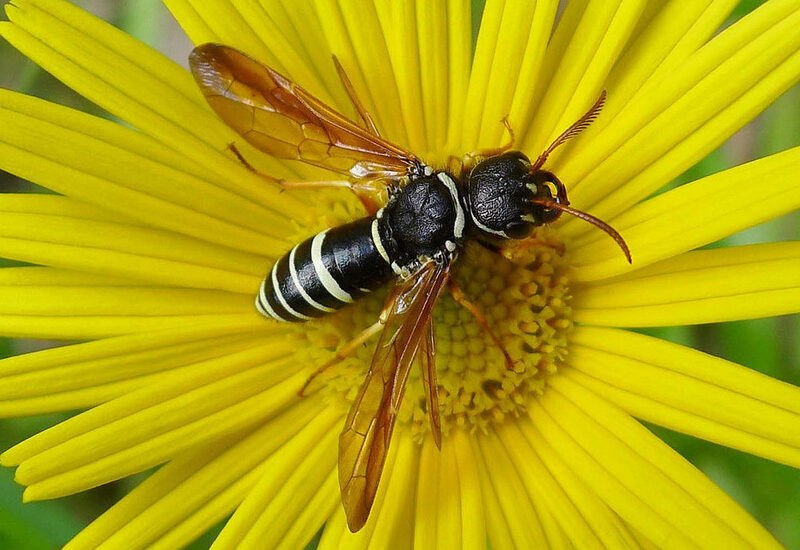 Distinguish wasps from bees by their hairless (or mostly so) body and skinny “waist.” The waist, technically called a petiole, is a somewhat cylindrical body segment (sometimes two segments) that fits between the thorax and the abdomen. Wasps are omnivorous. 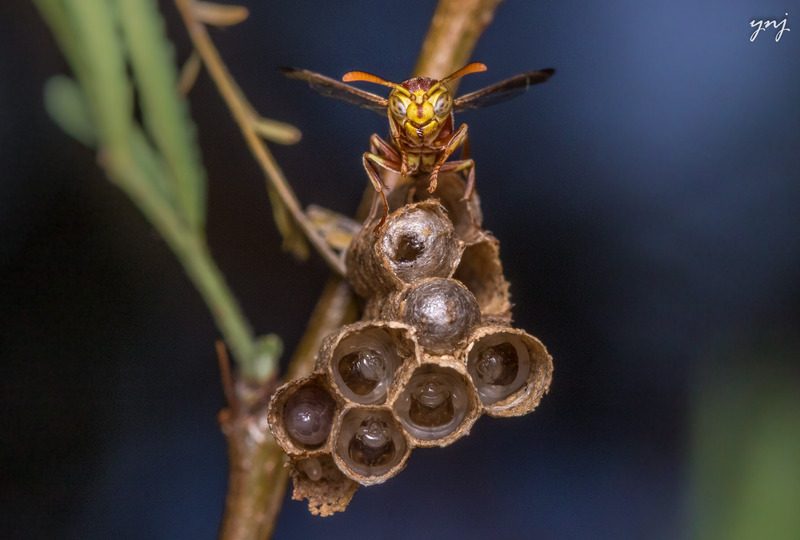 As adults, most wasps feed on nectar, but their young are carnivores and fed insects and spiders. Some wasps are parasitic and lay their eggs in the bodies of live prey. 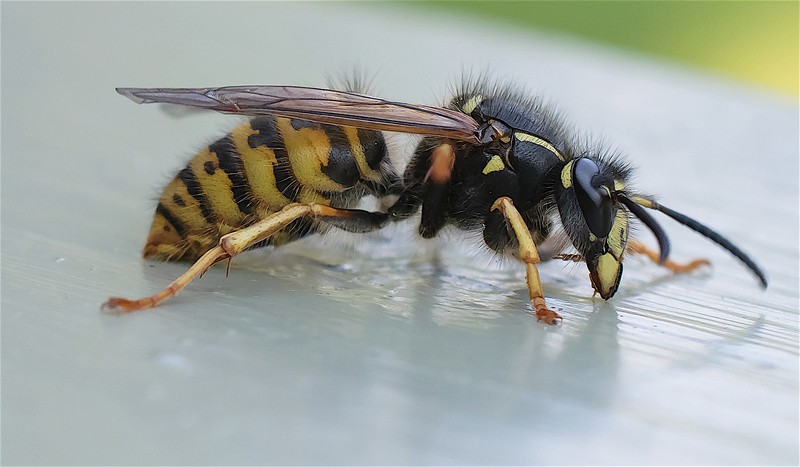 According to National Geographic, nearly every pest insect in the world is preyed on by wasps, which makes them valuable animals to patrol a garden. Some wasps are social; they have nests and a caste system. Paper wasps (family Vespidae) are an example. A fertilized queen constructs a nest containing a few cells, lays a few eggs in them and raises those offspring, which are sterile. Once they’re adults, the offspring take over the care of the queen and the hive. The queen’s job is to lay eggs. The hive gradually gets bigger as the family grows larger. Wasps nest in a variety of places. For example, yellow jackets commonly nest in the ground, but sometimes in wall voids and attics. Hornets build nests in bushes, on tree branches or sometimes the sides of buildings, in attics and walls. 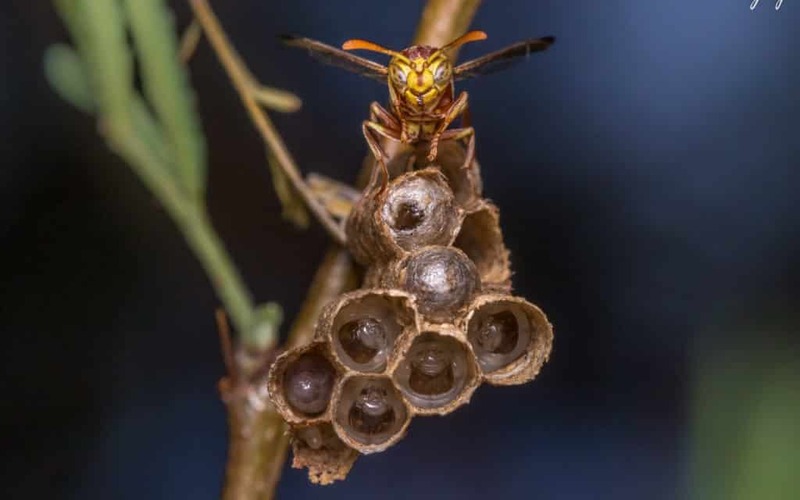 Paper wasp nests are constructed in trees, under the eaves of houses, in attics and other structures. There are more than 100,000 species of wasps around the world. All but about 1,000 species are solitary. The males of a parasitic Costa Rican species, Dicopomorpha echmepterygis, are the smallest adult insects in the world. Wingless and blind, they measure no more than 0.005-inch (0.139 mm) in body length. The female, which has wings, is only a smidgen larger. At the other extreme is an Asian species, the Asian Giant Hornet, Vespa mandarinia, which has a body length up to 1.75 inches (45 mm) and a wingspan of 3 inches (7.6 cm). In North America, wasps range in size from minuscule to about 1.25 inches (0.2 to 30 mm) long. Ants seem to be everywhere, don’t they? They live in colonies in many places: underground, in wood, in trees, in mounds, in spaces under flowerpots and inside unused garden hoses. And, of course, kitchens, if they can get away with it! Their colonies are headed by a queen or queens, which usually have wings. 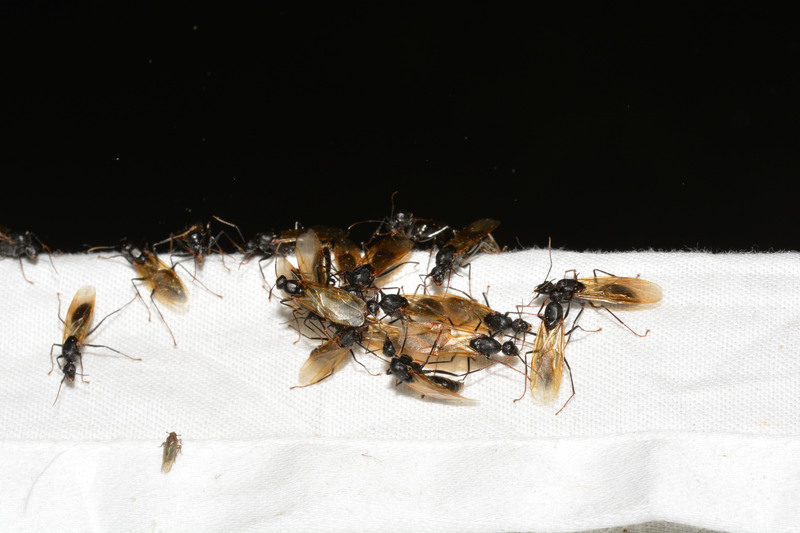 The ants we see out foraging for food are all-female worker ants, which lack wings. Colonies can be very long-lived, and queens can live up to 30 years. Most ants are omnivores with a varied diet that includes small insects, spiders, dead animals, fungi, seeds, and grains. They like sugary foods, too. Carpenter ants, for instance, are particularly fond of a sweet liquid called honeydew that’s produced by aphids and scale insects. Ants like people food, a lot — syrup, jelly, honey, bananas and other fruits, but also vegetables, bread, chips and other foods that people eat. Pet food, too. Depending on the source, there are an estimated 10,000 to 12,500 species of ants around the world, with thousands more awaiting classification. Somewhere between 580 and 1,000 species inhabit North America. Most ants range in length from 0.07 to 0.4 (0.2 to 10 mm) inch. The smallest ants in the world are believed to be in the genus Carebara. Carebara atoma, for example, is only about .039 inches (1 mm) long. The largest ant in the world may be the female Dinoponera gigantea, which is 1.2 to 1.6 inches (3 to 4 cm) long. 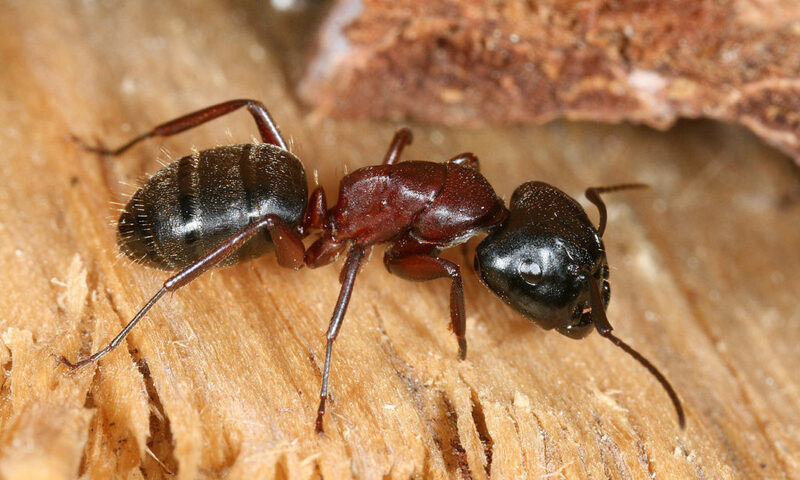 The largest ants in North America are probably Black Carpenter ants — workers are about 1/2 inch (1.27 cm) long, and the queens are about 1 inch (2.54 cm) long. Sawflies are wasps that don’t have a thin petiole (waist) between their abdomen and thorax. This difference makes many of them resemble flies. The “saw” in their name comes from the female’s saw-like ovipositor. Another distinction, with a few exceptions, is that their larvae look like butterfly or moth caterpillars, while bee, wasp and ant larvae are grub-like. Sawfly females use their ovipositor to cut into plants, including trees. They deposit their eggs in the holes, and the hatched caterpillars of most species feed on the leaves, usually in groups. A few species feed on plant stems. Adults are carnivorous, but some species also feed on nectar and pollen. Sawflies don’t sting. 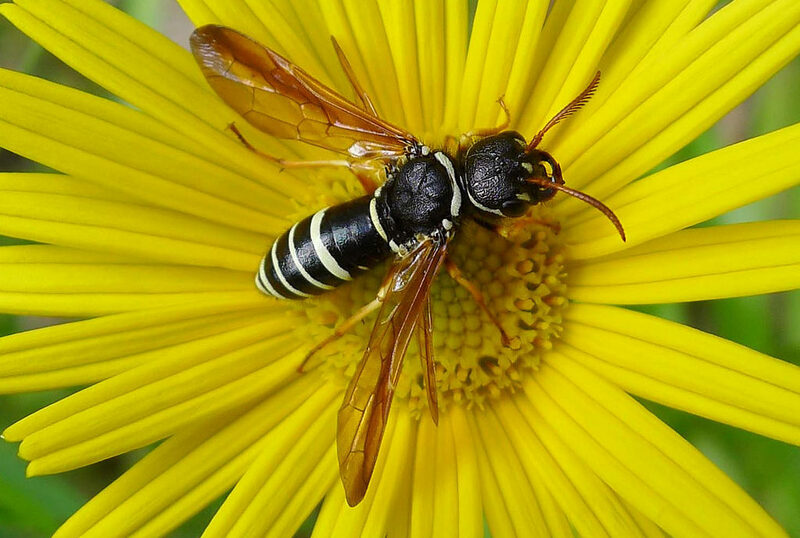 There are about 9,600 sawfly species in the world, with the majority in North America and Eurasia. The smallest adult sawflies are about 0.19 inch (3mm) long. Most species are in the 0.20 to 0.79 inch (5 to 20mm) range.